The purpose of the Mary Boyer Sustainable Agriculture and Food Grants are to strengthen our local food system by supporting female farmers, ranchers, and processors who plan to create sustainable solutions to expand or increase farm production in the High Country. The grant is open to female farmers, ranchers, and producers in our service area including the NC Counties of: Alleghany, Avery, Ashe, Caldwell, Watauga, Wilkes, Mitchell, and Yancey. THE GRANT APPLICATION DEADLINE HAS PAST FOR 2017/18. THANK YOU ALL FOR APPLICATIONS. Grant applications are typically released in the Fall and awards are announced in winter. Subscribe to our newsletter to stay up-to-date on grant opportunities. 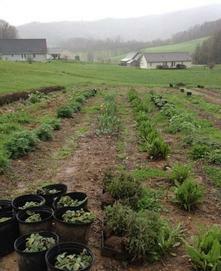 Andrea Stroh founded and operates Evening Sun Farm, a small family farm located in Watauga County. It is one of the few farms brave enough to focus on pasture-raised hog production in the high country. She was awarded the 2018 grant to convert the existing barn into farrowing stalls and a chute, which will make it easier to vaccinate animals and minimize the risk of losing babies. The project will allow Evening Sun to diversify and expand their operations. As the farm grows it will be able to provide the community with more pasture raised meats and will also create opportunities for farm tours and workshops. 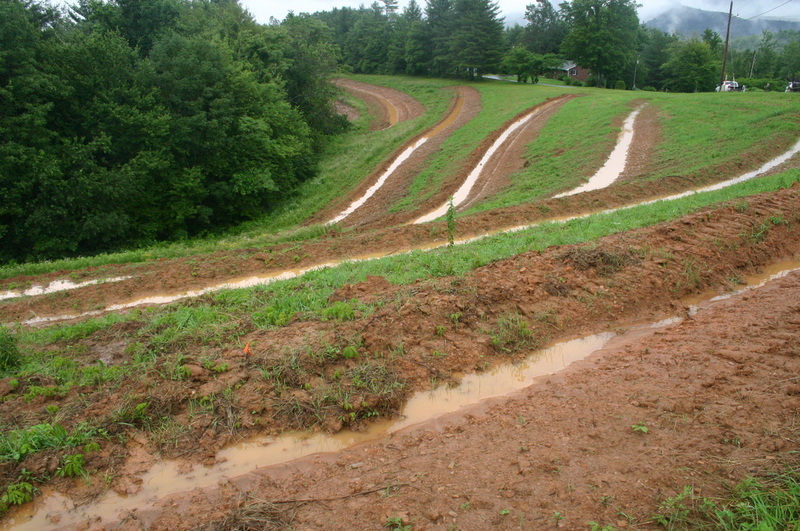 The Gentry Farm, located in Ashe County, has been in the Gentry family for five generations and focuses on using sustainable practices to preserve the farm for future generations. In 2013 Amanda Gentry and Wendy Painter began Mountain Popcorn Girls to create growth for the Gentry Farm, and each year popcorn production has increased. Mountain Popcorn Girls is going to use the 2018 grant to increase their customer base by establishing a strong online platform to share their story. They plan to use social media and their website to build stronger connections with locals and tourists, and also to demonstrate to others the important asset that online marketing can be for farms. Emily Young founded Happy Hens and Highlands Farm in 2014 to raise animals as humanely as possible after she learned about their treatment in factory farms. She operates her Yancey County farm with her husband Adam, and they have focused meat production on pasture raised poultry. They started with only one chicken and have now raised over 2,000 meat chickens and 50 turkeys. Emily was awarded the 2017 grant to continue expanding these operations by building another fenced-in pasture so the farm can raise 200 turkeys in 2018. The grant was also used to build another brooder house that can hold four times as many chicks. The farm has been unable to meet the Asheville-area's demand for local, pasture raised poultry, so increasing production will enable them to build expand their business in the community. Upper Yadkin Heritage is a third generation family-farm located in Caldwell County, and the long-term preservation of heritage poultry is their mission. Since 2011, they have been breeding, hatching, and growing heritage breed chicks , but infrastructure limitations have prevented the farm from expanding. Meagan Roberts was given the 2017 grant to establish an on-farm hatchery, which will improve the farm's environmental and financial sustainability, and also enable the farm to supply more farmers in the community with affordable local chicks. 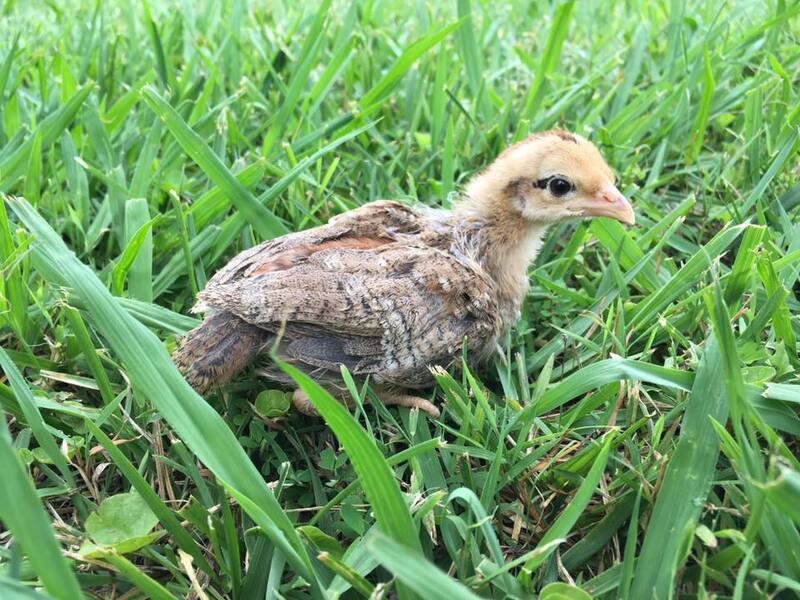 There is currently a lack of local poultry in the Caldwell County food system, but the heritage poultry hatchery will help other small, local farmers grow while improving the integrity of the local food supply. 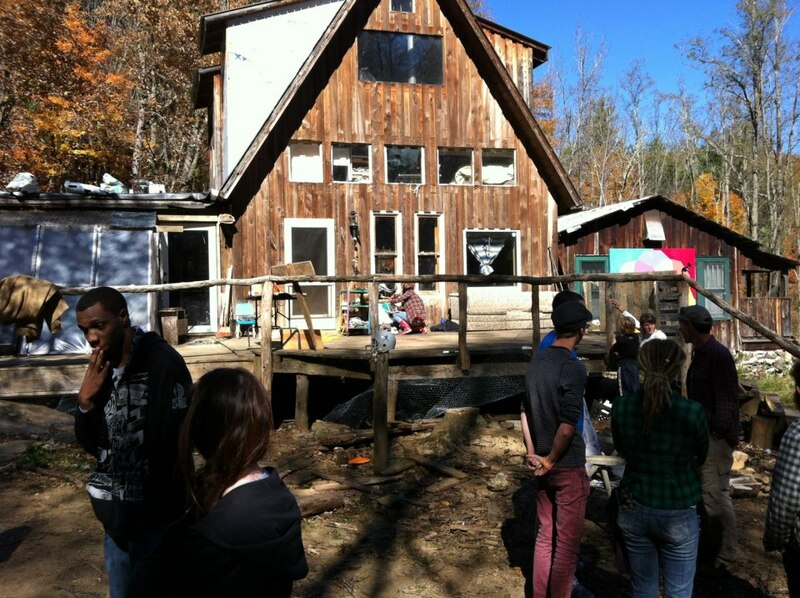 Anna Hurt owns and operates Mountain Roots in Lansing, NC. The farm embraces sustainable and organic practices to produce a wide variety of fruits and vegetables, and in 2015 the farm began using locally sourced wood logs to grow Shiitake and Oyster mushrooms. Usually mushrooms are grown in climate controlled warehouses, but the mushrooms at Mountain Roots grow in an outside laying yard. 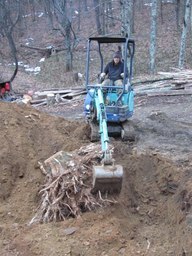 The 2017 grant will be used to purchase more logs so the farm can expand mushroom production. There are no large-scale mushroom producers in the high country, but once Mountain Roots expands, they will be able to provide local farmers' markets and restaurants with a consistent supply of mushrooms. ​Jaime Cool, owner and operator of Bee Kind Family Farm in Collettsville, NC used her award to purchase honey extraction equipment, making her business run more efficiently and giving her a better opportunity for growth. Bee Kind Family Farm was started in 2010 by Jaime and her husband Robb with only three hives. They now have sixty hives and hope to acquire one hundred by the end of 2016. They rear their own queen bees and hives, process all their honey on-farm, and sell to a few local markets, including the Caldwell Co. Farmers’ Market. The equipment they have purchased through this grant has allowed them to process their honey in a more timely fashion, meaning they can increase production and expand their small business. 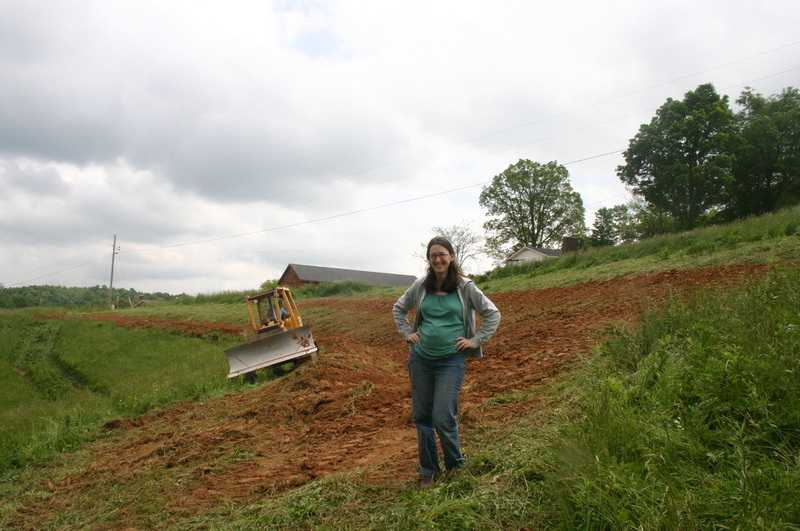 Melinda Brown ​owns and operates The Never Ending Farm in Vilas, NC. She has been raising pigs for eight years and has a desire to rear high quality, non GMO fed, pasture raised piglets for meat growers in the High Country. With the grant funds, Melinda was able to build necessary on-farm infrastructure, purchase piglets, and maintain proper pasture rotation methods. Melinda hopes that helping to improve pork production in the High Country and providing a local connection to quality piglets will make it more convenient for people to transition back to raising their own meat and garner more support for local meat producers and businesses. Susan Owen, owner and operator of Lily Patch Farm in Vilas, NC has used her award to plant a Pawpaw orchard. The Pawpaw is a native tree that produces a fruit of the same name and is gaining popularity. The Pawpaw fruit is sweet and tastes like a combination of banana, mango, and pineapple. Lily Patch Farm aims to increase production each year and sell saplings to other growers in the area. 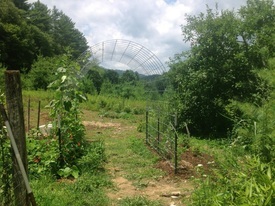 Susan Owen is also the Garden Manager at the FARM Café Garden Spot in Valle Crucis and is the winner of the 2014 Watauga County Woman in Agriculture award. 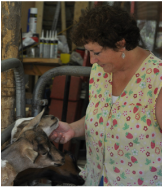 Cynthia Sharpe owns and operates Oakmoon Farm, a goat dairy in Bakersville, NC. The farm has an on-farm store, offers workshops, and has been featured in Our State Magazine. She has used her award to diversify and seek new solutions for her farm. Cynthia Sharpe plans to research the goat dairy tradition in Europe, re-design packaging and labels, explore new markets, and introduce new products to the farm. Cynthia plans to add egg-laying chickens, pastured pork, and a dairy cow to her farm to expand product offerings in the on-farm store. "High Country Small Scale Permaculture Orchard"
Elise McLaughlin, in Blowing Rock, NC, will use her award to plant a multilayer demonstration orchard, producing apples, pears, stonefruits, berries, fruiting vines, nitrogen-fixing plants, beneficial insect attractors, as well as benefitting birds and other wildlife. This orchard will maximize production while minimizing single-crop risks. Elise will use the orchard as a demonstration site for a Permaculture course at ASU and for other local farmers and beekeepers. "Diversifying the Small Farm Into Pastured Pork Production"
Amy Fiedler owns and operates Springhouse Farm, a certified organic farm in Vilas, NC. She plans to use her award to diversify her farm after intense flooding wiped out most of her crop in the summer of 2013. 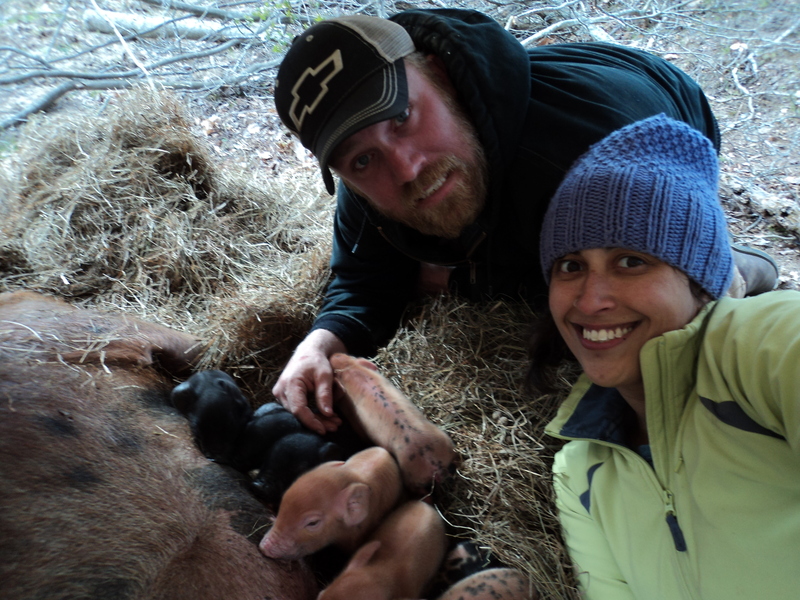 She will offer an alternative to factory farmed pork by starting her own Certified Humane pastured pig and pork operation, becoming a premier local source of feeder pigs and instructor to local farmers of humane pastured pork production. 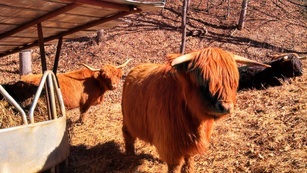 "Highland Handling to Reclaim the High Country"
Kae Arrington, in Mitchell County, NC, will use her award to build a minimal handling facility for her Highland cattle, which would enable Kae to handle the cattle safely alone or with one helper. Kae welcomes people to her farm to see and learn about the cattle and would enjoy the opportunity to help other women get started with basic cattle handling and care. This project has enabled Holly to develop a market in seed and small grain production. Holly has presented her workshop "Seed Saving as a Farm Enterprise" for multiple audiences, and you can view the full presentation here. The following 2012 grants were made possible through our partnership with Heifer International and the Blue Ridge Seeds of Change. 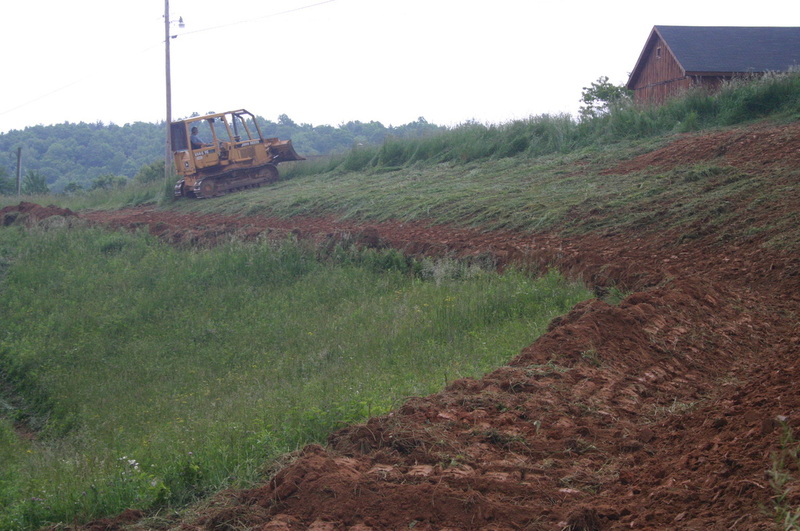 This grant supported the creation of a bioshelter on Woodland Harvest Mountain Farm in West Jefferson, NC. A bioshelter is a solar greenhouse managed as an indoor ecosystem. Different components of a bioshelter may include the external shell of glass & timbers, plants, animals, aquaculture, microlivestock and more. Bioshelters increase yield per acre, reduce pests, provide habitat and reduce energy consumption. According to the EPA, bioshelters can provide an 80% energy savings when compared with conventional greenhouses. This project relied on community support and participation as the construction was entirely a group-effort. Learn more about Woodland Harvest Mountain Farm here. 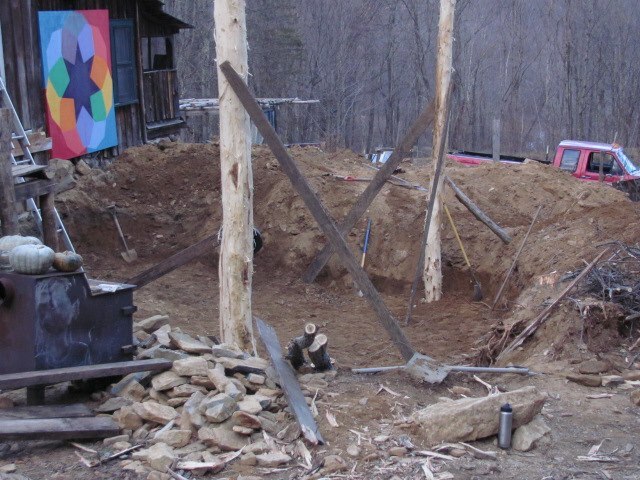 Early construction photos below. See more pictures of the construction here. 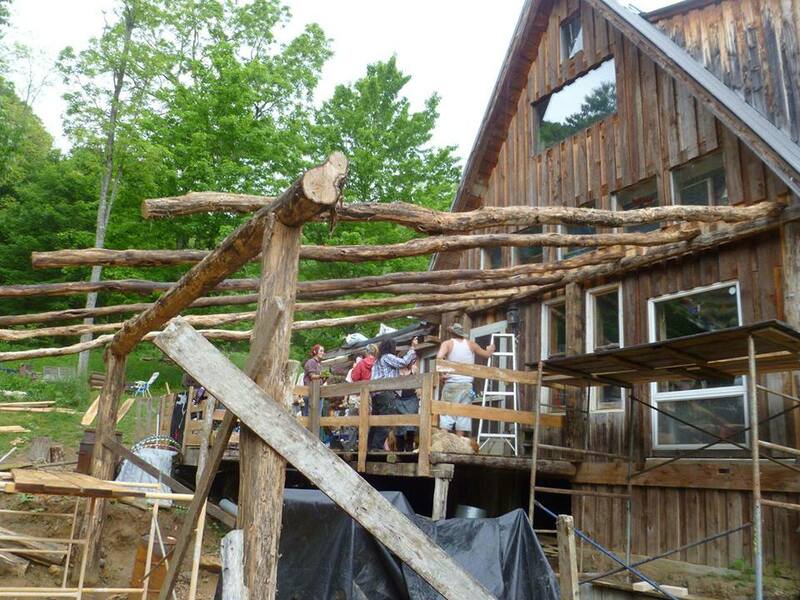 This grant enabled Trosly Farm in Avery County, NC to construct a brooding structure. The barn will serve as a "nursery" for all of the farm's livestock and will enable Kaci and Amos to hatch chicks on farm. See pictures of our visit to the farm here. Learn more about Kaci and Amos of Trosly Farm. Kaci and Courtney Baines, April 2013 workshop. 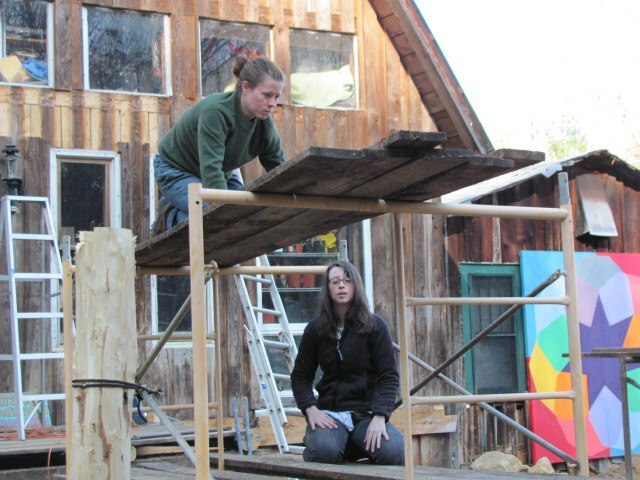 Testimonial from Kaci: "I don’t even remember at this point when I started working with BRWIA but it’s all been a great experience... With the grant, we started our barn. It’s a big, huge project that still has lots of steps that have to get done but it was awesome to get that jump start with the grant; it put us ahead so much this year because in the wintertime there are so many projects to get done but not money to do them, so it was awesome to get something done when we had the time to work on it." With this grant, the Nelson Family Farm has purchased fencing and livestock with which they have arranged an intensive grazing system. 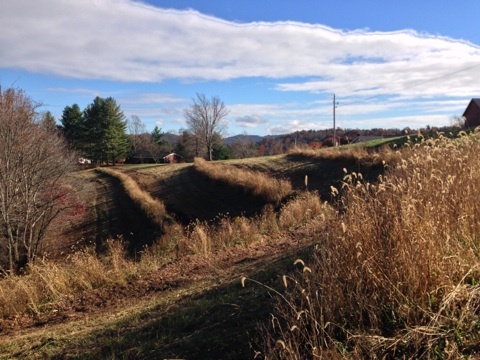 Through this project, the Farm will have the opportunity to educate consumers about grass-fed, locally raised products and farmers on alternatives to carcinogenic chemicals traditionally used to control this type of overgrowth. Old Season Farm in West Jefferson, NC is on a mission to grow perennial food crops that have high market value and can be sustainably grown in our region with minimal inputs. To this end, they have planted fifty trees/year for the past three years. 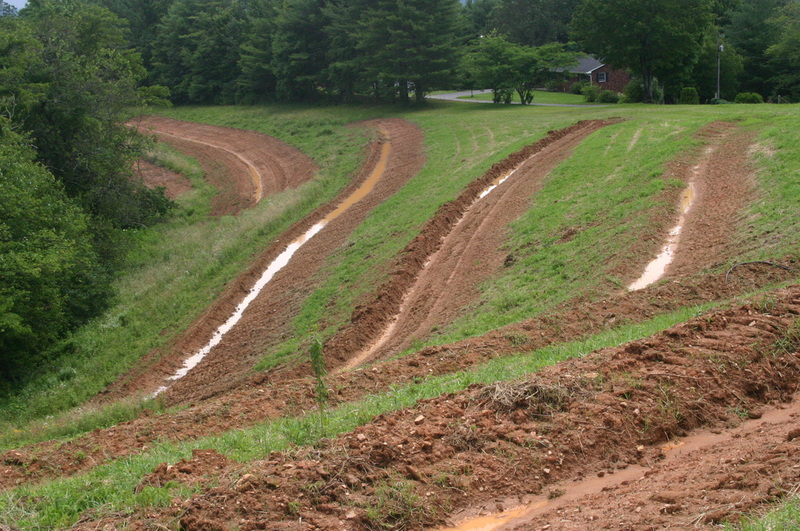 An issue they have faced as they build their orchard is water management. The weathered, well-drained soils on most hillsides in our region typically do not provide enough moisture or fertility for perennial crops to thrive, and they are especially vulnerable in the establishment stage. “Keyline design” is a system of whole-farm water management and soil improvement developed in Australia during the 1940s. The basic principle is to use carefully-placed passive landscape features (such as swales and ponds) to improve water retention and soil health. 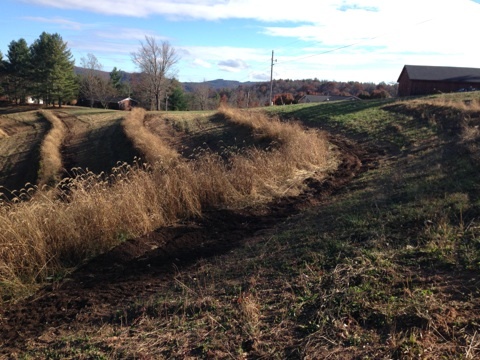 With this grant, Old Season Farm has dug swales and so far they have functioned as hoped, holding extra water from big rain events but not overflowing and damaging the berms. 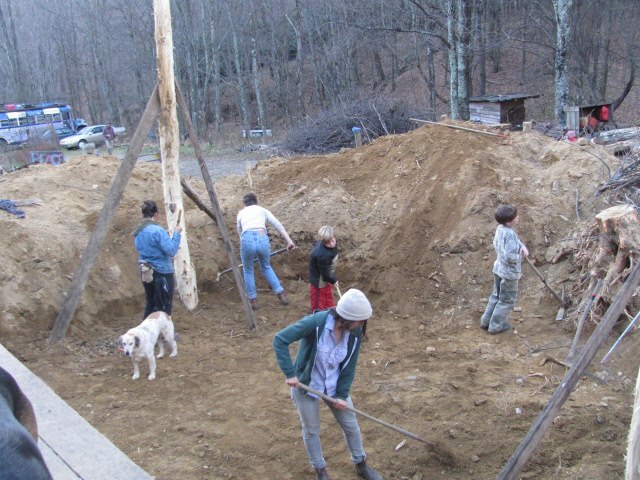 Old Season Farm will host an on-farm workshop in February 2014 to report on their project and share their progress. The first row of Swale Photos below were taken in January, the second row were taken on a recent November visit to Old Season Farm. Holly Roark: Used funding to explore the feasibility of top bar hive beekeeping. In 2011 and 2012, we were able to partner with agricultural organizations and offer farmer scholarships to regional sustainable agriculture conferences. With the support of the Organic Growers School and AgraQuest, we were able to help Meredith Duke of Ripshin Goat Dairy attend the 2012 Organic Growers School Conference in Asheville. Ann Rose and Holly Whiteshides received free registration and lodging for Southern SAWG’s 2011 Practical Tools and Solutions for Sustaining Family Farms Conference in Chattanooga, TN. 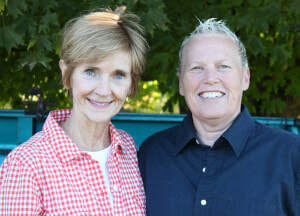 Diane Baker and Dorene Jankowski received scholarships to attend the 2011 Organic Growers School Conference in Asheville, NC.